Conquer the perils of the multiverse with Gimli from The Lord of the Rings™! Build stronger-than-an-ox Gimli and join him in an exciting mash-up multiverse of your favorite characters! Place him on the LEGO® Toy Pad and see him spring into action in the game, then activate his special Super Strength and Mini Access abilities to solve puzzles and overpower the enemy. Use his Axe Chariot to speed up the action and rebuild it into an Axe Hurler and Soaring Chariot for upgraded powers in the game! Price is 3% below the initial Lego retail price, a € 0.39 discount! This comes down to 26.07 cent per brick. The Gimli Fun Pack (71220) Lego set is available from the sites below. However, they do not offer delivery to your selected region. The Gimli Fun Pack (71220) Lego set is no longer directly available from the sites below. However, 3rd party partners of these sites might still have the set available. 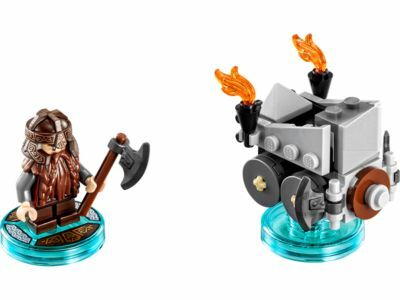 Alternate description Challenge LEGO® DIMENSIONS™ enemies of any size with the Gimli Fun Pack, featuring a buildable Gimli minifigure, axe and rebuildable 3-in-1 Axe Chariot.